Exporting is an excellent way to grow a successful business and at Ecotile we have been developing several new markets to build on our dominance in the UK. Manufacturing a high quality product or offering top quality service is clearly essential and at Ecotile we are committed to doing exactly that, but it is only the beginning. Once you are confident that your product or service meets the requirements of your local market you may think you can just roll it out to other regions or countries straight away – people are pretty much the same everywhere right? Wrong! Exporting is a complicated process and many companies fail because they haven’t done their research in to the market they are trying to penetrate. Offering that high standard of quality is key but it is equally important to understand the local market place you are trying to sell in to. Too often exporters assume different countries and problems are the same as their own markets and make assumptions which inevitably turn out incorrect and stall progress long term. At Ecotile we work incredibly closely with our distributors and customers in other countries to understand their markets, traditions and how we can genuinely add value to their business, such practice has seen a massive expansive in our export division over the last 18 months, with sales spanning all major continents and 43 different countries to date. 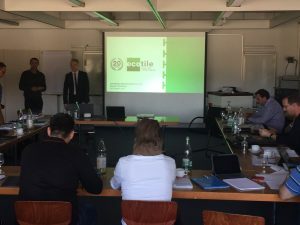 Our Sales Director (Richard Allen) and German Sales & Marketing Executive (Carsten Riedel) have spent the last two weeks in Germany, Switzerland and Holland working together with existing and potential customers to understand exactly how Ecotile can help provide a valuable solution in their market places. It is this kind of commitment and understanding that is helping us drive exports and genuinely allowing us to ‘solve flooring problems’ around the globe. 1. Is there a need for your product? You may be solving a problem for your customers in the UK but elsewhere they may have a work around or simply not consider it to be a problem. This is particularly true if your product or service is related to legislation particular to your country. Are there already companies offering something similar to you? How do they differ and why? Is there something about this new market that means you may need to modify your product before it is useful and if so is it worth the investment? What price is acceptable to this market and will you make the margin your business requires? How should you communicate your message? Do people go to exhibitions to find new suppliers and if so which one is most relevant to your industry? Which trade magazines do people read – is it worth advertising in them? Do people do all of their research online in which case a pay per click campaign would be beneficial. What tariffs and duties will be applied to your product and will these price you out of the market? What is the transport network like in this country – will you be able to deliver your product to your customers quickly and cheaply? Are there reputable partners you can work with to help you avoid the common pitfalls of exporting to this territory. This is most important of all. How do people like to do business? Will they work with you direct or do you need to find a distributor to represent you? How do they like to communicate? In person, on the phone or by email? What do you need to do to win their trust and persuade them to invest time and resource in you? What must you absolutely avoid doing? This may all seem like a lot of effort and very boring when you’re excited about getting your product in front of a new set of potential customers but if you don’t find out about these areas first you risk wasting a lot of time, effort and money. What Is The Best Alternative To Epoxy Resin Flooring?